Adding to their highly popular selection of Brainbox games, Green Board Games introduce a version based on top children’s author Roald Dahl. These fast action games are full of cards containing facts and figures about each chosen topic. Kids can study a card for 10 seconds, and then have to correctly answer a question based on the roll of a dice. The Roald Dahl Brainbox Game is full of questions on all of his most popular books - and children who spend hours reading these wonderful tales are at a distinct advantage! All the quirky illustrations are from the instantly recognisable Quentin Blake sketches, and combined with this fast action game (that can be played by almost any number of people) Brainbox have another huge hit on their hands. 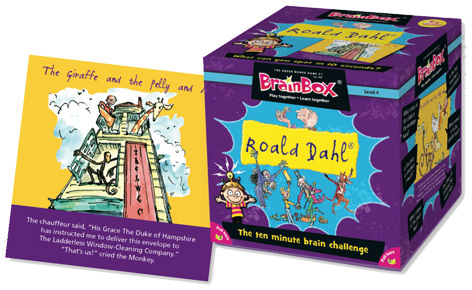 Toy Shop UK loves these Brainbox games for their simplicity and quickness of play, and combined with a highly cherished English author, The Roald Dahl Brainbox Game is definitely one of our favourites! Please tell us what you think of Roald Dahl Brainbox by BrainBox Games and Green Board Games.